At last night's Hollywood Film Awards, Dan Scanlon, the director of Monsters University was in attendance to accept the Hollywood Animation Award on behalf of the entire crew. Monsters University was chosen as this year's recipient by the Hollywood Film Awards creator, Carlos De Abreau who noted that, "Once again, the animation and storytelling of 'Monsters University' reflects Pixar creativity and greatness". Sean Hayes, the voice of the argumentative and loving two-headed Terri and Terry in Monsters University presented the award to Dan who was eloquent in his acceptance speech. Dan thanked the entire Pixar crew, his wife Michelle, many of the beloved "brain trust", the hard-working Producer, Kori Rae and many others. Our favorite moment of Dan's speech was when he mentioned, "Films don't always come out the way we picture them in our heads. So lastly, I want to thank the myriad of failures and detours along the way in making this film that crafted it into a movie far better than anything I could have imagined." Congratulations to the entire Monsters University crew for the recognition of all your hard work! May this be a fantastic kickoff to an award season full of rewards. 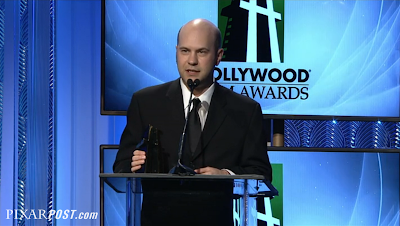 Be sure to check out this video of Dan's acceptance speech from the Hollywood Film Awards. To view additional photos of Dan Scanlon and Kori Rae, visit Getty Images.